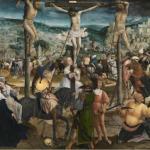 Jan Provoost is one of the most important artists in Bruges in the 16th Century. He obtains many projects from the city administration, the Brugse Vrije and the churches. A few of the paintings that he makes indicate a connection with the Bruges literary and humanistic circles and the chamber of rhetoric. He also fulfills his prominent functions within the guilds of sculptures and saddlemakers. He makes a pilgrimage to Jerusalem and probably upon return becomes a member of the Bruges Jerusalem brotherhood. Provoost signs only two works. The oeuvre is thus assembled on the basis of stylistic comparisons, supported by the results of the material-technical research. He also dates only two of his works. This makes it very difficult to order his oeuvre.Ca. 1465	Jan Provoost is born in Bergen (Henegouwen). 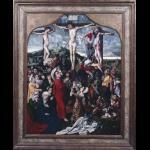 He was probably raised there by his father Jan Provoost the Elder, who is also a painter. He completes his education with the painter and book illuminator Simon Marmion in Valenciennes. A certain ‘Jan Provoost' is registered in the Antwerp St. Lucas guild. It is probably the same artist, but that is not certain. Jan Provoost receives the poorterschap of Bruges and is in that same year admitted to the Bruges guild of sculptures and saddlmakers, to which all artists belong. It is possible that Provoost makes his pilgrimage to Jeusalem in this time period. The pilgrimage could have also taken place between ca. 1502 and 1505. Provoost becomes the ‘second founder' of the sculpture and saddlemakers' guild. Maximiliaan Frans becomes a student with Provoost. Provoost becomes ‘first founder' of the sculpture and saddlemakers' guild. The second wife of Provoost dies before this date. Provoost becomes ‘first founder' for the second time in the St. Lucas guild. Provoost becomes governor of the guild of sculptures and saddlemakers. Provoost becomes ‘first founder' for the third time of the sculpture and saddlemakers' guild. Provoost becomes elected dean of the sculpture and saddlemakers' guild. Provoost carries out the whole management of the decorations for the Joyful Entrance of Charles V into Bruges. Provoost meets Albrecht Dürer in Antwerp. Dürer mentions in his journal that he draws Provoost's portrait. Provoost and Dürer travel together from Antwerp to Bruges, where Dürer is Provoost's guest for three days. Dürer draws Provoost and his third wife Katelijne Beaureins again. 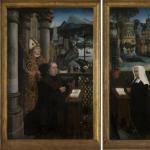 In this year, Provoost paints the painting with presentations from the life of Antonius van Padua (KMSKB, Brussels). 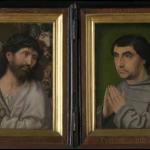 Provoost paints Christ carrying the Cross and the portrait of a Friar (Memling in St. Jan's Hospital Museum, Bruges). Provoost becomes member of the Brotherhood of the Jerusalem pilgrims. He is probably Knight in the Order of the Holy Grail. 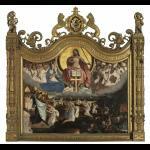 Provoost paints the Last Judgment (Groeninge Museum Bruges). In this year he is regent of the Brotherhood of the Jerusalem pilgrims. Adriaan Provoost, Jan's son, becomes freemaster in Bruges. He probably receives his education in his father's studio. Provoost is once again chosen as dean. Jan Provoost dies in Bruges.